ICRR Registration Opens- RRS will again sponsor attendees and offer discounted SIT room rates. Keep an eye on your inbox for more information! 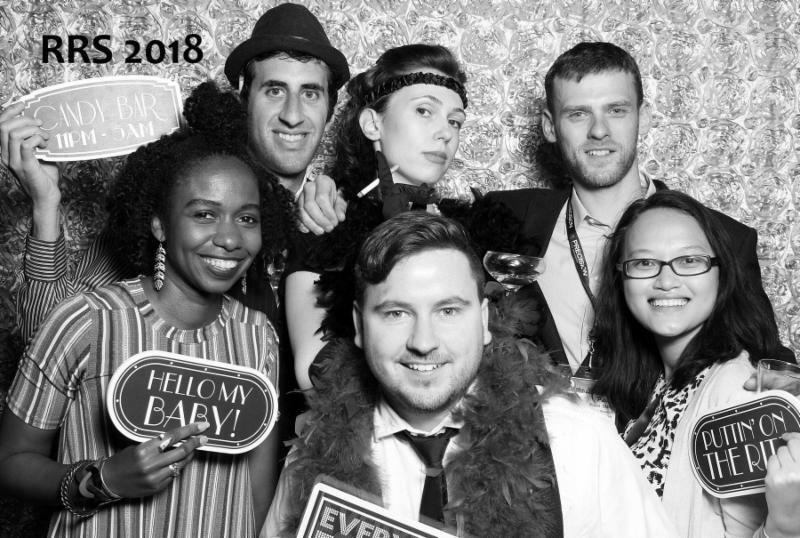 For those who attended this year's Annual Radiation Research Society meeting, I hope you had a productive meeting, caught up with old colleagues and even met some new ones. For me this meeting was especially meaningful as I take on the new role as SIT Committee Chair and finally met (most of) the SIT committee members in person (we missed you Jason and Nick) after months of email communications! This year the SIT committee underwent great changes as we saw the departure of four committee members, who we would like to thank for all their hard work and service to the SIT community - particularly the departing SIT Committee Chair, Dr. Pavel Bláha. But this year marks a new beginning for the SIT committee, as we welcomed our new SIT Committee Vice-chair, Jason Domogauer at the SIT luncheon. Together, the committee is excited to share with you our vision of the SIT community going forward! One of the goals we have this year is making the SIT newsletter more informative and encouraging more SIT engagement by providing SIT members with more relevant content. To achieve this we have added new sections to the monthly newsletter. - Thank you to Britta Langen and Jade Moore for planning a successful Elevator Pitch session at the SIT workshop! - Slides from the workshop can be found in the SIT documents. - Please take a few minutes to complete the workshop survey: TAKE ME TO THE SURVEY! The SIT workshop is for YOU, the SIT community, therefore your input is vital in letting us know what is working and what change(s) you would like to see for future workshops. We currently have more than 400 SIT members who are doing amazing work, but we only meet up once a year to share it. To better showcase the diversity of the SIT community we have started a SIT member feature of the month, where we will highlight an SIT member's work in a column of each monthly newsletter. A lab feature is also highly encouraged! This is an opportunity to give your work more exposure, practice writing an elevator pitch and learn more about the research that's happening within the SIT community. As researchers we are not limited to our roles in the lab or within the research community. We can all play a greater role in shaping science policy at the local or even the national level. Brian Canter has been doing an amazing job with the Policy and Advocacy section to highlight policies that impact the SIT community. In the monthly newsletter we will highlight approaching fellowship and grant deadlines relevant to SIT members. While the committee will do our best to update and share grants we are aware of; this can become a great resource with crowdsourcing, so if you know of any upcoming fellowship or grant applications please let us know. Your contribution will be vital in expanding this list to include different career stages, fields of study, and different geographic locations. In this section, we will highlight publications from the SIT community, so please share with us your recent publications! The articles we share in this section can be published in any journal, so this is a great opportunity to share your work to the SIT community. Pre-prints are also highly encouraged. Is your lab looking for a new post-doc? A new lab tech? Or is your department advertising for a new faculty position? In this section, we will include space to share information regarding available positions in radiation research, and help those who are transitioning to the next phase of their career identify new positions. We also encourage you to contribute to the career section if you are aware of any available positions. We are recruiting new committee members! Want to have a more active role within RRS? Then the SIT committee is for you! Amazing SIT Committee ARing at the annual conference Jason Domogauer and Nicholas Colangelo not pictured. I hope that these changes we are implementing can help improve the utility of the monthly SIT newsletter and encourage more contribution from the SIT community. Quick Bio: I'm currently a research fellow at Baylor of College of Medicine in Houston Texas. And yes, everything is bigger in Texas. My work is focused on using machine learning techniques to predict radiotherapy response from routinely acquired medical images. Of note, the Associated Press reported last week that the Environmental Protection Agency is acting to relax limits on radiation exposure. Interestingly, the broader context on this rollback is the EPA's mission to be more transparent with scientific data supporting environmental regulations. In an April memo explaining this focus on transparency, the EPA quotes Dr. Edward J. Calabrese, Professor of Environmental Health Services at the University of Massachusetts. Dr. Calabrese asserts that the newly revitalized focus on transparency by the EPA "Represents a major scientific step forward by recognizing the widespread occurrence of non-linear dose responses in toxicology and epidemiology for chemicals and radiation and the need to incorporate such data in the risk assessment process." In addition, Dr. Calabrese testified at a Senate hearing discussing the EPA's implementation of transparent science in regulations. More to come on this story in next month's newsletter! This month we are featuring the Sawakuchi lab at MD Anderson Cancer Center UTHealth Graduate School of Biomedical Sciences. 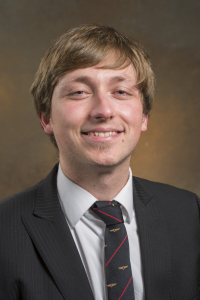 David Flint is a PhD Student in the Medical Physics program. His work aims to better understand the biological consequences of the dense patterns of energy deposition created by charged particles. His research focuses on studying the biological response of cells to helium and carbon ion radiation, with a specific focus on how a cell's proficiency in different DNA double strand break repair pathways governs its radiosensitivity as the ionization density of the radiation increases. Towards his project, David has characterized the survival of a number of cell lines with differing DNA repair proficiency exposed to helium and carbon ion beams at HIMAC in Chiba, Japan, and is currently working on using immunohistochemical staining to highlight the DNA repair processes used to repair the damage induced by these ion beams. Conor McFadden is a Research Engineer specializing in instrumentation development. 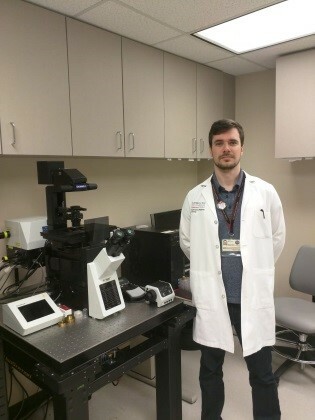 His research focuses on development of custom portable confocal fluorescence microscopes for use in clinical radiotherapy beams. These tools are combined with transfected cell lines and fluorescent nuclear track detector (FNTD) technology to simultaneously measure local energy deposition and biological response to charged particle tracks with high time resolution. Experiments have been performed in proton beams in Houston and Carbon ion beams in Heidelberg, Germany, and involve collaborators all over the US, in Germany and Japan. 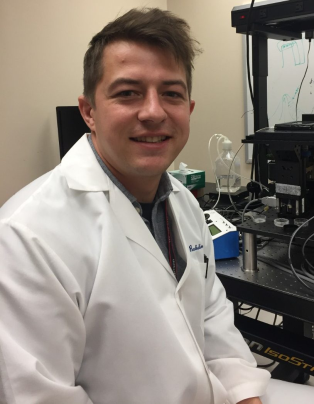 Scott Bright is a postdoctoral fellow specializing in radiation biology. His current research focus is understanding cellular responses to proton radiation with particular emphasis on DNA damage response. His work aims to understand what defects in cancer cells make them particularly susceptible to proton radiation when compared to traditional x-ray therapy. Current lines of investigation focus around the two main DNA double strand break repair pathways and how homologous recombination deficiency may be a key determinant in susceptibility to proton radiotherapy. Much of the experimental techniques revolve around molecular biology and imaging, more recently these techniques have been applied to experiments conducted in Japan with heavier ions such as helium and carbon.